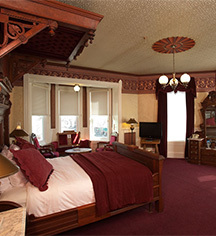 One of the West’s iconic hotels, the Strater Hotel is the center piece of Durango in every way. Located two blocks from the Historic Durango & Silverton Narrow Gauge Railroad, it is also the heart of fun and entertainment. The interior is adorned with beautiful handcrafted woodwork, period wallpaper, and the largest collection of American Victorian walnut antiques. Everywhere you look are high quality features of the Old West. The world-famous Diamond Belle Saloon features nightly entertainment including top rated ragtime piano players. A recreational mecca, Durango features a plethora of family activities including Mesa Verde National Park Operated for 3 generations by the Barker family, The Strater Hotel invites you to experience the best of the Old West and the best of Durango. Louis L'Amour found the atmosphere so inspirational that he frequently booked rooms 222 and 223 to work on his western novels. Adjoining Rooms: Adjoining rooms are subject to limited availability. Please notify request at time of booking. Airport Transportation: Not provided by hotel. Deposit: Credit card guarantee required to book. Card will be authorized 48 prior to arrival and charged at check out. Early Check-In/Late Check-Out: Subject to availability; complimentary when available. Extra Person Fees: $10 per night. Hotel/Resort Fees & Taxes: Accommodations subject to a resort fee of $3.24 per night. Resort fee covers WiFi, parking, and business services. All reservations are subject to a tax of 9.9%. Rollaways: Available upon request; complimentary ($15). 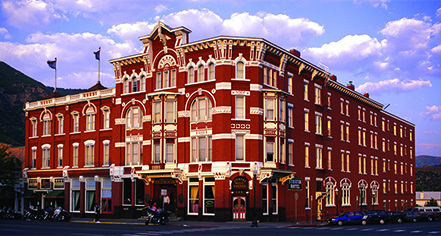 One of the West’s iconic hotels, the Strater Hotel is the center piece of Durango in every way. Located two blocks from the Historic Durango & Silverton Narrow Gauge Railroad, it is also the heart of fun and entertainment. Learn more about the History of The Strater Hotel .